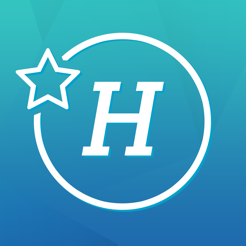 Cheap Hotels is a free app to help you find the cheapest hotel prices worldwide. The app searches over 80 booking systems. Enjoy the benefits of paying zero surcharges, totally secure payment, and the lowest prices guaranteed! With Cheap Hotels, you will always be able to find the right hotel for you, no matter where you are. 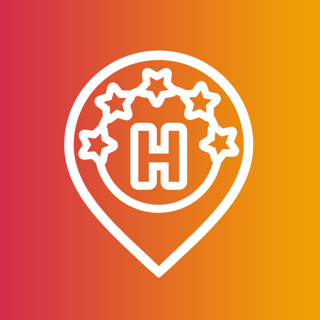 Our app will help you search for hotels, hostels and apartments by comparing and processing the most up-to-date offers from around the world in less than a minute’s time. This is the perfect solution for anyone who likes to travel while making the experience as cost-effective as possible. We have over 5 years’ experience working with travel services. This has allowed us to develop a unique app that integrates useful functionality with an appealing interface. You can start saving on your vacations right now—it’s easy and convenient. 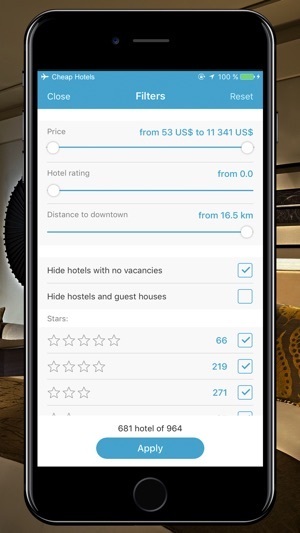 Cheap Hotels is very easy to use: just install the app, select your city, enter the booking dates, and sort the results using the filters. 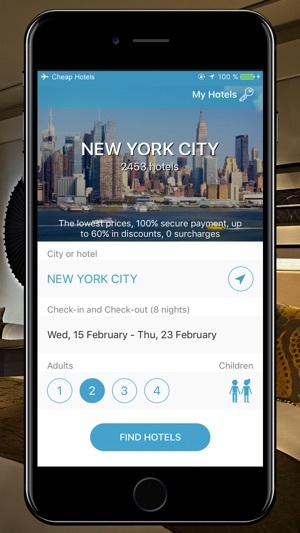 - The app lets you book a room at the hotel price. We don’t add a single cent to the price. - Fast, convenient search of the cheapest hotel prices with just a few clicks. - Adaptable interface: the app works great with iPhone and iPad. - A convenient sorting and filtering system with several search criteria. 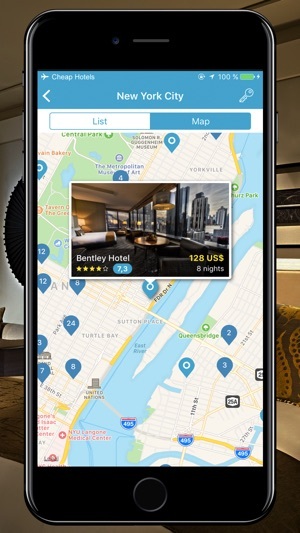 - The Search Map option lets you find a hotel in the best location for you. - Get the full information on your hotel, including photos, a detailed description, the list of available services, and user reviews. - The My Hotels feature lets you create a list of the hotels you like so you can learn more about them or book a room at a later time. Cheap Hotels is an indispensable solution for travellers. 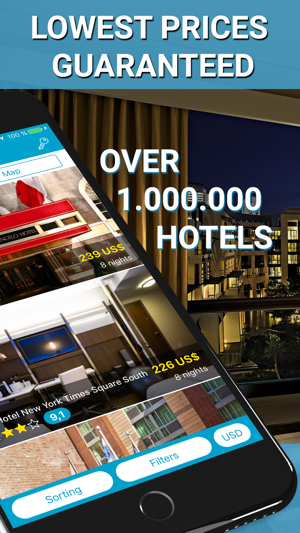 Searching for the lowest hotel prices has never been easier. But don’t take our word for it—see for yourself by downloading the app right now! There's not much to say this app is the best booking experience you can imagine. Found myself clicking around and enjoying it for hours. Needless to say we are trying to book as much as we can vis this app. They have done a great job imagining what people need when they are looking for hotels, the information architecture / tools at hand deserve standing ovations. 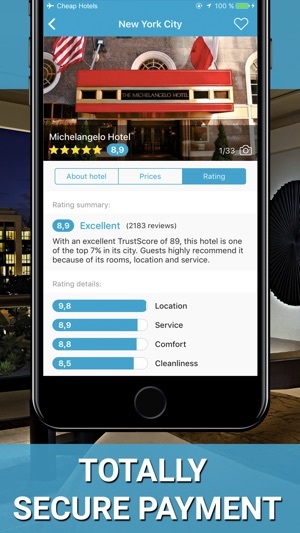 A really useful and easy to use app and i prefer to book my hotels with it rather than my computer. Excellent and efficient. Love the great deals they offer along with the extra 8% if you book in app. Coupled with promotional 20% gift cards I bought thru Samsung Pay this was by far the cheapest site to reserve my hotel stay! Btw I called customer service to verify the room I was looking at was the same room I saw on the hotel's website before I booked. The customer service rep was so friendly, helpful and even called the hotel to verify. Will definitely be using in the future!